Doctor & Rose. Just some fanart using lyrics from the song "Love me enough" byt Swithfoot, hope 당신 like it. Wallpaper and background images in the The Doctor and Rose club tagged: the doctor rose tyler 10th doctor doctor who bbc fanart lyrics sweitchfoot. This is so sad. 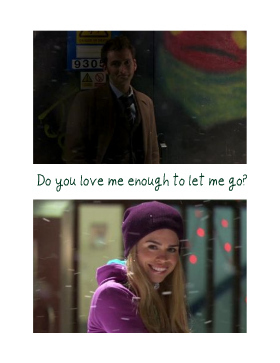 I love that he said goodbye to her before he regenerated, that is one of the sweetest scenes in the entire series--and Rose doesn't even know it.